As I mentioned in the previous post, I am hosting a tailgate this coming weekend at the University of Tennessee game. 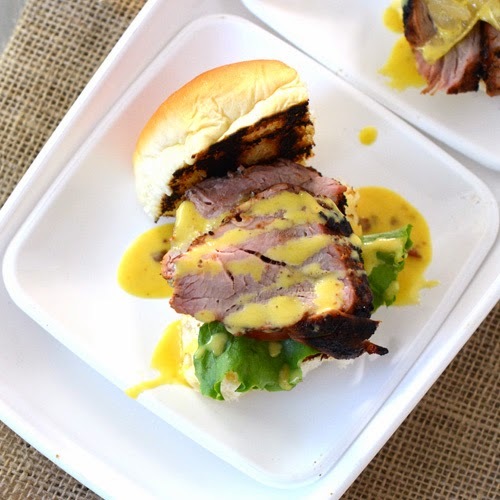 The National Pork Board and Kroger are sponsoring my tailgate and one of the menu items is these Smokey Pork Tenderloin Sliders with bacon honey mustard sauce. We did a test run with them this past weekend and tried a variety of toppings. Our two favorites were caramelized onions on the grill and/or cole slaw and that is what we are going with at the tailgate. This recipe might look long but it is really easy and it's perfect for game day food because I'll give you "make ahead" tips so the only thing you have to do at the tailgate is grill the onions, tenderloins, and toast the rolls. Make the slaw. Stir the dressing ingredients together, pour over the cole slaw mix in a large bowl and toss to coat. Best if made at least 1 hour in advance and can be made 8 hours ahead of time, kept refrigerated and stirred occasionally. Set up your charcoal grill for indirect heat with the coals to one side. Preheat grill to 400 - 450f. Season the pork on all sides with the BBQ rub. Make the bacon-honey-mustard GLAZE. Take half of the SAUCE and thin with 2 Tbsp of vinegar. You will use the GLAZE to brush on the meat and the SAUCE to drizzle on top of the slider. Start the onions. 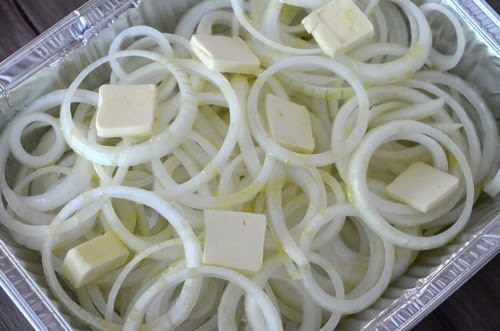 Place the onions in the pan and top with oil, pieces of butter and a few pinches of salt. 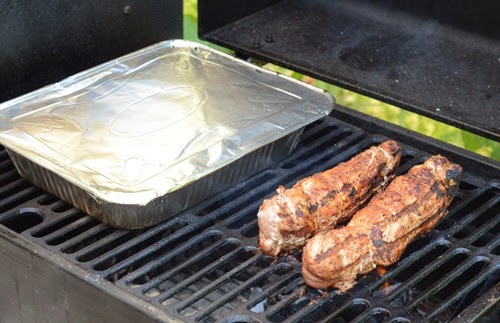 Cover with foil or lid and place on the grill on the indirect side (not over the coals). Cook with the lid closed for 25 minutes. 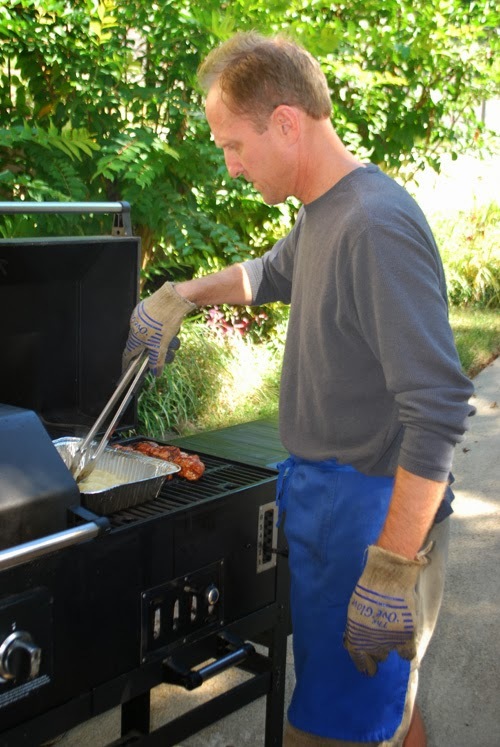 Every 5 minutes or so, wearing heat resistant gloves, shake the pan to toss the onions around. Add the pork. Place 3-4 of the hickory briquetes on the coals. Oil your grates and place the tenderloins on the grates directly above the coals. Remove the foil or lid from the onions and sprinkle with the sugar. Cook for 20 minutes, stirring the onions and turning the tenderloins every 5 minutes or so. Finish it all. Glaze the pork with the bacon-honey-mustard glaze on all sides and cook until the internal temperature reaches 140f, remove and let rest. Stir the onions until almost all of the liquid has evaporated and the onions are browned, remove from heat. 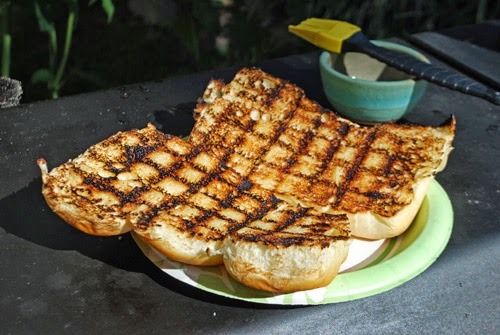 Optional - Toast the buns over the coals until browned. This just takes a few seconds. Serve it up - Using the sharpest knife you have, slice the tenderloins "lunch meat thin" on a bias. 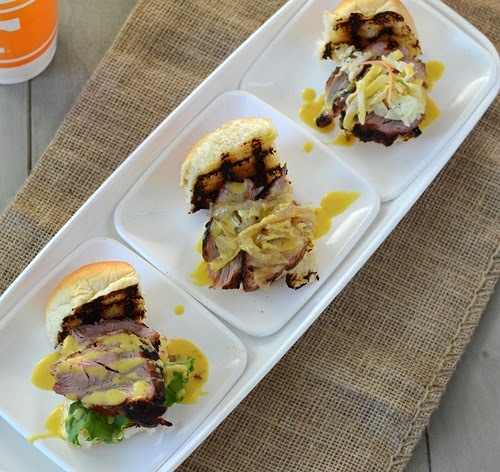 Place 2-3 slices per bun, top with onions OR slaw, and drizzle bacon-honey-mustard sauce on top. Bacon Honey Mustard sauce - make my recipe the night before OR just stir 3 Tbsp of pulverized cooked bacon into 2 cups of jarred honey mustard sauce from Krogers. Slaw - Make up to 8 hours before hand but stir every hour or two and keep refrigerated. Onions - Prep the onions the night before and store in the half steam pan, ready to throw on the grill. Pork - Trim, tie and season them 6-8 hours in advance. 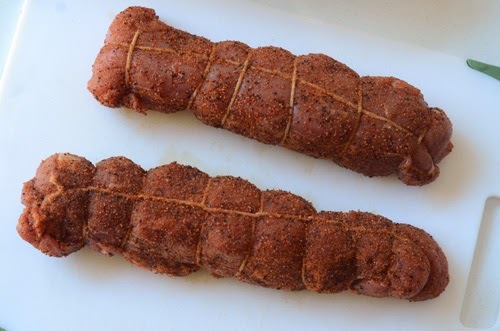 Wrap each tenderloin in plastic wrap and refrigerate until an hour before grilling. Remove wrap before grilling, of course. Pork - If you absolutely can't grill on site for your tailgate, here's another option. Grill the tenderloins at home. When they are done, double wrap them in foil, place them in a small, empty cooler, and top with dry towels. This should keep them warm for a few hours and you can just slice them on site. 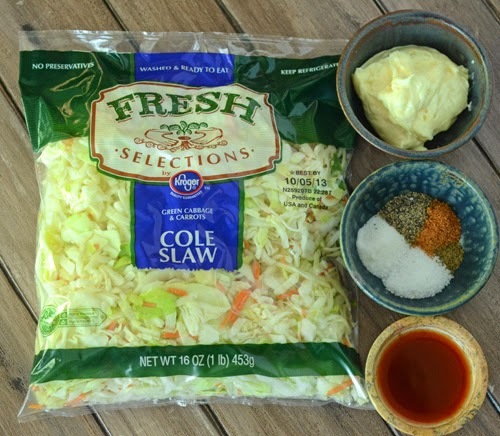 For the slaw, I used Kroger's bagged slaw mix to save time on prepping. When making slaw in advance and adding the dressing, err on the side of using too little dressing (dry). Slaw will release moisture as it sits. When ready to serve, toss the slaw and if it still needs more dressing, add it then. The half steam pan will be full to the brim with onions. It will seem like too much, but it will shrink down to about a forth of this or less. 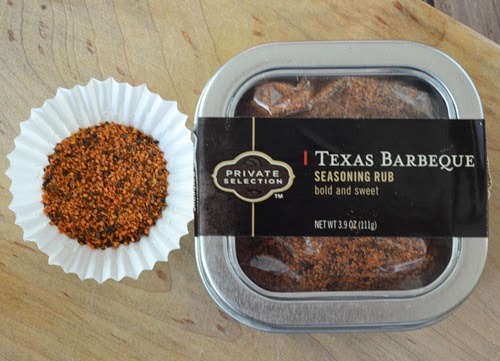 You can use any spicy BBQ rub but I chose to use Kroger's Private Selection Texas Barbecue rub found in the grilling section. It has a pronounced peppery note on the front end that yields to a slightly sweet finish. Tying the tenderloins is optional, but it lets you fold the skinny end under the rest for even cooking. 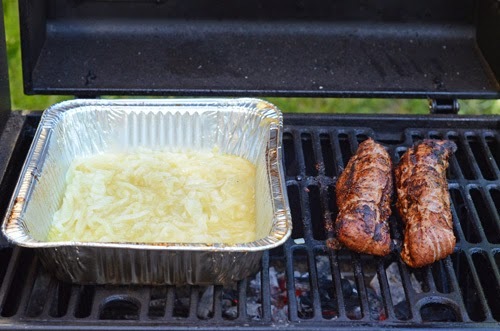 You can see that the onion pan is not over coals but the tenderloins are. Although this is grilling, not smoking, I like to add 4-6 Kingsford Smokehouse Style Hickory Briquetes (briquetes of compressed hickory, not coal) to the burning coal for some smoke flavor. You can find these in the grilling section of your Kroger. Give the onions a stir every time that you turn the pork. The first time I left them covered the whole time and none of the liquid evaporated. That's why you have to take the lid off after 20-25 minutes. See how much the onions reduced in volume? 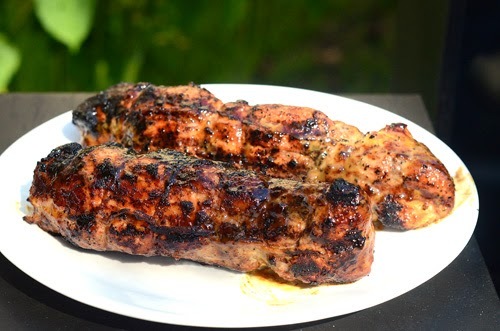 The pork tenderloins will look strangely yellow when you first glaze them on the grill with the bacon-honey-mustard glaze but give it 2-3 minutes and it cooks on, looking normal. 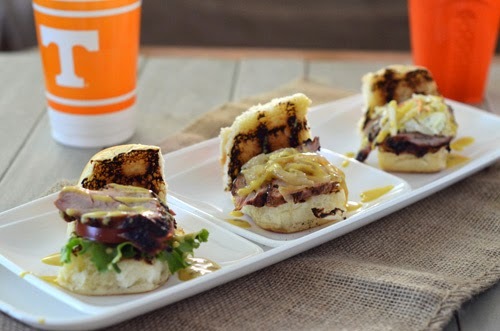 Tip For Great Buns - Toasting is optional but adds so much texture to these sliders. 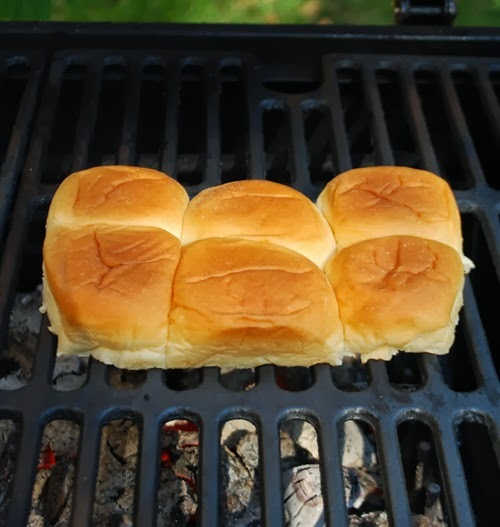 To make it easier, don't separate the rolls until after you toast them. Just pull out the 12 pack, slice it down the middle with a bread knife. Toast them open side down until toasted, which should only take about 20-30 seconds. You don't want to be handling 18 individual rolls in 20-30 seconds, right? Do it in a batch like this. When you slice the tenderloins, slice them at a sharp angle like this so you have longer pieces of meat to fit the sandwiches. My favorite was this one with the caramelized onions and bacon-honey-mustard sauce drizzled on top. The slightly smoky meat, toasty buns, tender onions, and rich sauce really came together for a great slider. There was nothing wrong with the lettuce and tomato slider, it just wasn't as good as the other two. But it is a lot simpler since you don't have to make slaw or onions for it. 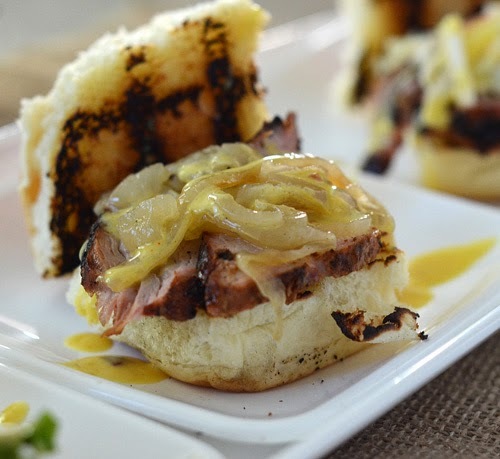 I'm excited to have these pork sliders on the menu, they are easy to make on site, it only takes one had to eat them, and they taste wonderful. 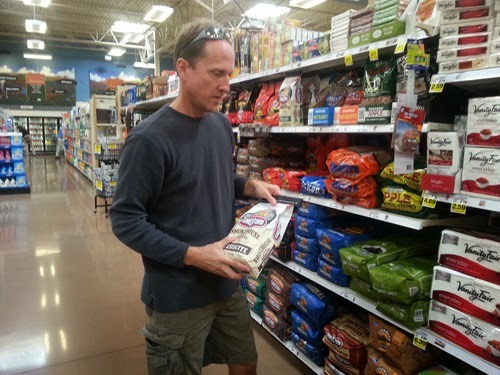 Wednesday I'm doing the shopping for my tailgate at the new Kroger Marketplace at Kingston Pike/Cedar Bluff. If I look indecisive here it is because I ended up going with hickory instead of the pictured mesquite. Not only do they have great prices on choice cuts of pork, they have 115,000 square feet of anything you could need for a tailgate! Not just grocery items but home goods too like grills, grilling accessories, storage containers, kitchen items, small appliances, and more. It's like two stores in one, seriously. When I worked in the corporate offices of a grocery chain in the late 80s/90s, 40,000 sq ft was an average store and 55,000+ was a large one. Then the "super stores" hit the scene and a lot of retailers just built big stores but executed the merchandising and operations poorly. It's not just about being bigger and Kroger gets that. I have one more recipe coming up this week and then it's time for the tailgate! 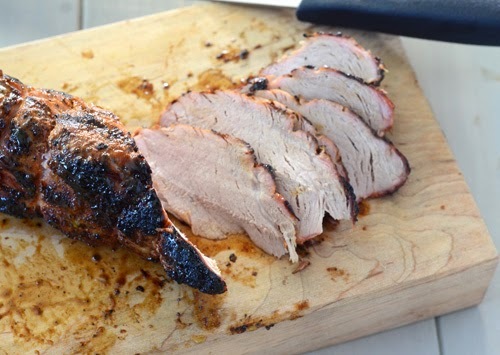 For more great pork recipes, check out Pork Be Inspired. For the latest great deals on pork, check out Kroger.com. [Standard Disclaimer] I am being compensated by Kroger and The National Pork Board to throw a tailgate and post about it.